The cube-shaped house poking out of a forested slope in Portland’s Northwest Heights has been on home tours. In design magazines. The topic of conversation. And now it can be yours for $1.25 million. 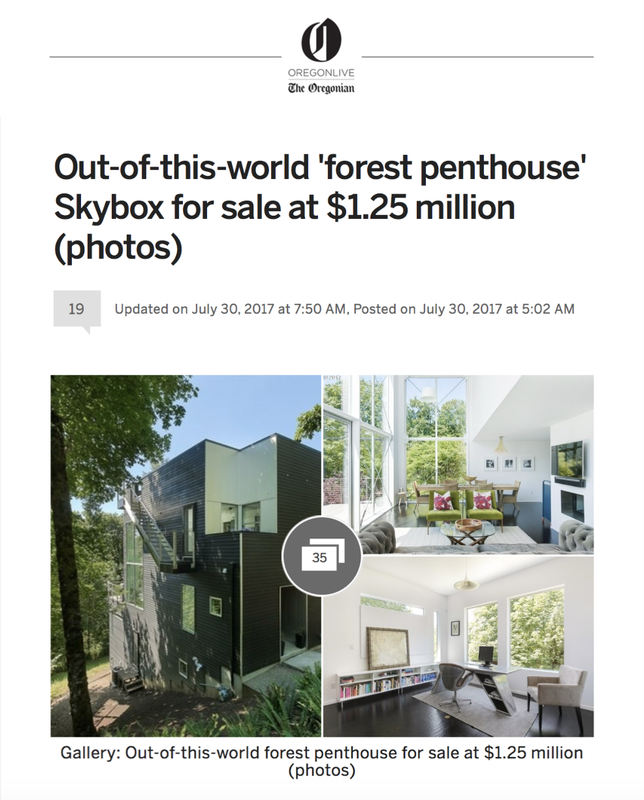 Skybox, an inventive loft-inspired, three-level house at 1737 NW Skyline Blvd., was put up for sale on Monday, July 24. The 2005 custom dwelling was named Skybox because of its shape and location on Skyline Boulevard. The treetop abode was designed by Stefan Andren, the product design director for Nike and Motorola before he started Krownlab, an architectural hardware manufacturer. If you see a sleek designer barn door or frameless, sliding shower door, the pricey pulls and precision tracks might be made in Portland by Krownlab. Cool factors: The rooftop observation deck has an outdoor shower and hot tub. The main floor has 16-foot-tall windows and walls that soar two stories high, except where the upstairs master suite and sauna sit. The 2,886-square-foot house has two other bedrooms and 2.5 baths. The exterior’s dark stained cedar is as dramatic as the interior’s burnished aluminum. Listing agent Sean Becker of Sean Z Becker Real Estate compares the custom home, on a 0.73-acre lot, to a penthouse in the forest. It’s a phenomenal home, says Becker, who speculates the property would be appreciated by discerning design savvy professionals.